Ehime Maru Recovery Site Surveys and Dive Support | Sea Engineering, Inc. In 2001 the Navy submarine USS Greeneville surfaced rapidly under a Japanese fisheries training vessel, resulting in the sinking of the vessel and the loss of nine lives. In a state of the art salvage operation the vessel was recovered from deep water and towed to a shallow water recovery site off Pearl Harbor where the bodies of the victims were recovered. 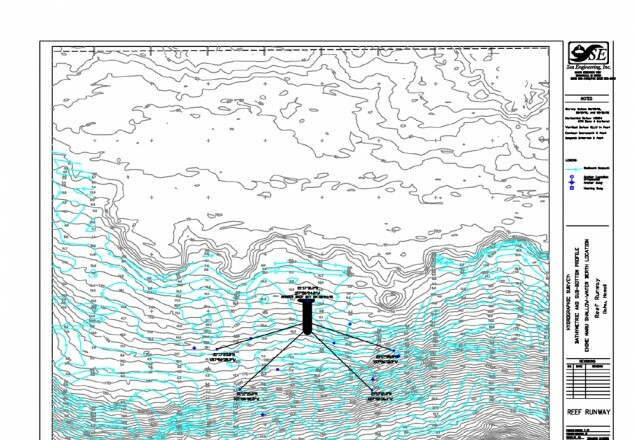 Sea Engineering conducted detailed bathymetric, side-scan and subbottom surveys of possible shallow water staging sites for the recovery of the vessel. Bottom morphologies were mapped, and the data were presented in 3-D perspective plots, plan view contour plots, and isopach plots of sediment thickness. Sea Engineering received the “2001 CNO Environmental Planning Team Award” from CINCPACFLT as a member of the team responsible for environmental planning in support of recovery efforts for the M/V Ehime Maru. At the competion of the recovery of bodies by U.S Navy divers, Sea Engineering provided the diving services during the movement of the ship from the shallow water recovery site to the final deepwater disposal site 20 miles south of Pearl Harbor. Tasks included checks of the rigging and explosive cable cutter charges at both sites.